1)Are you the kind of person who would love to talk in office meetings, but always end up sitting quietly in a team argument? 2)Are you the one whose opinions are never heard amongst your colleagues? 3)Are you that same human being who is always looked down by everyone when they converse with you? 4)Do you lack argumentative skills? If your answer is YES, this post is just for you. This morning, Chronicwriter spent nearly 20 minutes in the loo to come out with a solution for people like you. If your answer is NO, you can still read this post. I am sure that you know that everything written here is crap. The intention is to see that bright smile back on your face. Consider the scenario of you being in a room with ten of your colleagues and the discussion is getting hotter. The Boss is sitting chairing the argument. This is your opportunity to gain his attention by talking wisely. But If you are the kind of guy who doesn't even understand what the topic is, then you gotta take my advice. Let us assume that the Topic is "Pricing the New-product" . Of course No one in the meeting room will have any idea about what might be the best pricing mechanism for the product in talk. The Product manager (The Boss) would also not have any idea on what is happening in the room. This is where you gotta understand the reason behind the meeting. Usually Bosses conduct meetings because they would have seen this picture. If you had gone through the above picture, you would know that the Boss would be the one who would usually do the initial talk. This initial talk would go on for some 30 minutes. This is the time when you are supposed to eat the biscuits, drink coffee and send text messages via your hand phone to your friends. Do not ask silly questions to offend your boss. Let the boss do all the talking. 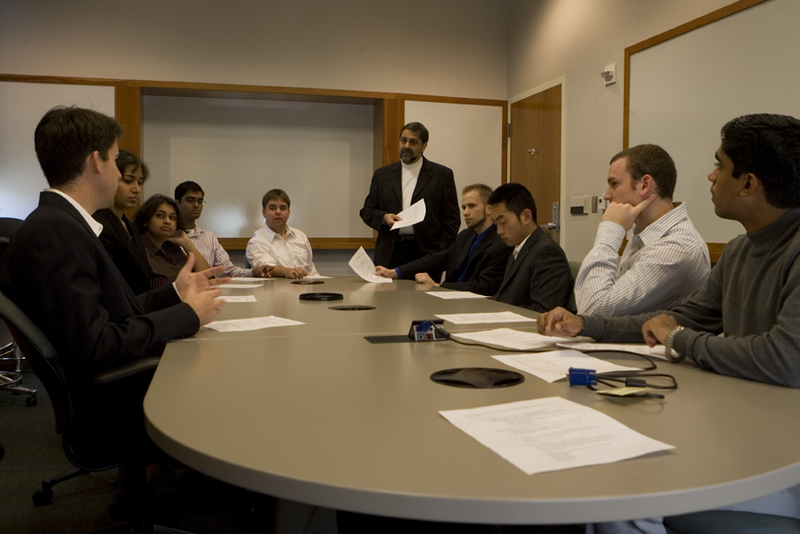 After the initial speech is over, you and your colleagues get the opportunity to discuss and brainstorm to arrive at a conclusion. Always remember to start the conversation after the boss finishes his speech. Make it sure that you give a dizzy feeling to your team-mates in your starting lines. So always start with a quantitative analytical report. (In other words, Speak Numbers). So please dont start the argument by saying," We should price our product cheaper to penetrate the market". Instead just say:" The average product line leverage buying capacity from the customer side is $86 per month which is 24 % higher than the average buying capacity of an individual customer"
The ground rule is simple. No one should understand what you speak.Round one is yours. You would have surely got your boss's attention. But remember that all your 9 colleagues are also there to get the boss's attention . So there would surely be one Smart-Head who would pop up the question," Where did you get that figures from?". Do not fret. Just make up an instant answer, " This is from the Haylard and Montengmor Report on retail products and it was published in the European Journal of Marketing -Volume III" End this line with " Haven't you read it yet?" .Say this in a stern voice.This is the exact moment you are supposed to turn and look at your boss and smile gently. Now you have made the rest of the team members feel so small. So you can start munching on the doughnut and give others an opportunity to speak.It is impossible for anyone in the room to continue from your initial opening statements. So invariably the team members would try to change the topic and take it in a different direction. In the mean time, make it sure that you finish the doughnut and get ready for the second tactic. The second tactic is very risky and it should be used with great precision. The following five points should be memorised before you use the second tactic. In addition please memorise the abbreviations MTD, SRSL, TQM (Total quality management). Please do not ask me what the first two abbreviations stand for. Just expand them using your creative brains. Now I hope you would have memorized the five words/phrases and also the acronyms. Now I will explain how to use these phrases in a meeting. Suppose you want to say," Class-B customers would prefer to buy 3 products per month but they do not have enough money". I can bet you that you won't win an argument by talking plain simple sentences like that. If you want to shock your team mates the second time say this," So let me put it this way,in terms of product buying capacity of the Class-B Customer,the demographics can be segmented according to their negative buying power per se, as it were MTD." Only an idiot would challenge this statement. Now you would have even made your boss look very inferior. So even your boss might be scared to ask any doubts and make a fool of himself at this juncture. Now just sit back, relax and watch all your team mates faces. They would be shell shocked for sure. But do not relax for more than five minutes, because by then they would have regained their composture. But even if they regain their compusture, do not worry because you still havent driven the nail in the coffin. Humor is the name of the final nail. You have taken the discussion to a whole new level and your colleagues would be in the middle of an heated argument. Time would be running out of their hands and hence they would be waiting to pounce on each other at the slightest of mistakes committed by the other team mate. So this is where you should drive the nail in the coffin. Always keep a few sarcastical lines in your memory. You can use these lines when someone tries to corner you. For example remember these three remarks. Also do not forget to use the classic remark: Are you feeling uncomfortable? You say: In 2008 the Finance minister Mr. Fernandez issued.. When nothing works out and if your colleague has cornered you to the wall, look into his eyes and say " You remind me of my strict grandfather" and before he could reply, end your statement by saying," Are you feeling uncomfortable?". If he says No, you can start it all over again with the quantitative analytical report. Meetings would never have been this much fun in your life. though i dont fall into the above stated category, i still read it. all bcoz you toiled it after 20 minutes of time in the loo. nice analysis there. No seriously. You have indeed done some serious research. this happens to me all the time. When i write some humorous post, i endup sounding serious. but when i write a serious and poignant post, people comment that it was the funniest post they read since long.i guess something seriously wrong with my sense of humour. "You say: In 2008 the Finance minister Mr. Fernandez issued..
You say: Don't be too defensive"
I have occasionally found myself as one of the three types of persons and I have found my answers. Yay! But I loved your post. Great tips to make your colleagues look : buzz off and tell your boss that : I'm a genius. I am wondering what will happen on the day I will become the boss...! Chriz... you are damn clever. Yes it brought a huge grin.. but your wit reflects in every sentence. 5)Consider this scenario (Chronicwriter started this post with this line)"
hahaha,thanks chriz,it must be handy in some time :D..
this is awesome tho ! my very own blogger buddy b-school ! hahahahah! This is seriously a grt post dude...u rock! So let me put it this way, your blog rocks in terms of qualtiy per se. make that soon post like "real soon"
I think im goin to ask my bschool people for a fee refund...they can never teach all this...haha..nice one. ha ha h ahah.... the exact reason i held meetings at my job previously.. and d exact way i used baffle ppl with figure n pie charts n stuff... lolzzz..
this is ur best yet!!! Chriz......really a great post....!!! luv reading this....bro ur really a freaky....!!!! The ground rule is simple. I love it!! Just came from night shift and it was worth checking your page mate. MTD : Month-To-Date : We use this term quite frequently @ work. Even at times we all sound funny etcetera but maybe I've not mastered the art of writing hilariously funny posts yet. Yep, got the bright smile back!! So funny because its so true!! During meetings, I feel like an orange in a basket of apples..really! Btw post was REALLY funny :D !! One of my managers use this one very frequently in discussion and meetings- "So let me put it this way" - Now many people have started imitating it. What u started writing as a humor post probably turned up as an informative post. I agree, sometimes professionalism is more about show-off than substance!! But not always so..
WOW! That's explains a lot about you :) Rock on, dude! The BOSS might be reading this JK! This happens not only in meeting even the smallest of discussions and status updates. I realised it all after reading ur posts. Ha ha...Meetings are good excuses to sleep! But the constant suplly of tea and coffee, do let me take the nap while all others Yap..yap and yap..
Mate, you are tips are a little late, but I can still make the use of those witty phrases!! Wooo....Very informative. It always happens. Gunners do exist in almost every team. :-) And its fun to be one! Will use these strategies at my work..Nice post. 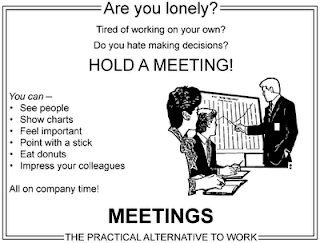 If there's anything I HATE in my work life, well then thats MEETINGS. At Meetings, I simply sleep with my eyes open. Have tried such tactics already and I got the name "Araathu party" from my PM. After this I never open my mouth in meeting, I just nod my head for everything. looks like our policy in exams..
as a techie, can't stand meetings but, seems like there are ways of making them interesting enough. I never in my faintest thoughts, had any idea on this concept of winning the argument...hehe... thanks for sharing ur GYAAN with us. you know wat chriz..i got a job(yes first job ) and iwas reading ur blog in office :|..big mistake..
and i tasted office-public- humiliation :(..
are u taking any more classes some time? hey chriz...this is seriously a nice post....feeling very sleepy now i dont know why!! What a brilliant ideas...woh..you are Great.Your toilet is a great place...why dont you blog about your toilet?..its the bothi tree for you.. I wonder what I've been doing for so long, not reading your blog! It was awesome.. the 'Meeting' poster had me cracking up. Haha!! So true!The post was hilarious to the last letter.!! LOL!